If you love classic ghost stories, Disney’s Haunted Mansion offers more than thrills and chills. This four-part series takes a look at classic ghost story images the attraction brings to life. “It was by this time growing somewhat late. The gig, according to order, was brought round to the door with both lamps brightly shining, and the young men had to pay their bill and take the road. They announced that they were bound for Peebles, and drove in that direction till they were clear of the last houses of the town; then, extinguishing the lamps, returned upon their course, and followed a by-road toward Glencorse. There was no sound but that of their own passage, and the incessant, strident pouring of the rain. It was pitch dark; here and there a white gate or a white stone in the wall guided them for a short space across the night; but for the most part it was at a foot pace, and almost groping, that they picked their way through that resonant blackness to their solemn and isolated destination. In the sunken woods that traverse the neighbourhood of the burying-ground the last glimmer failed them, and it became necessary to kindle a match and reillumine one of the lanterns of the gig. Thus, under the dripping trees, and environed by huge and moving shadows, they reached the scene of their unhallowed labours. 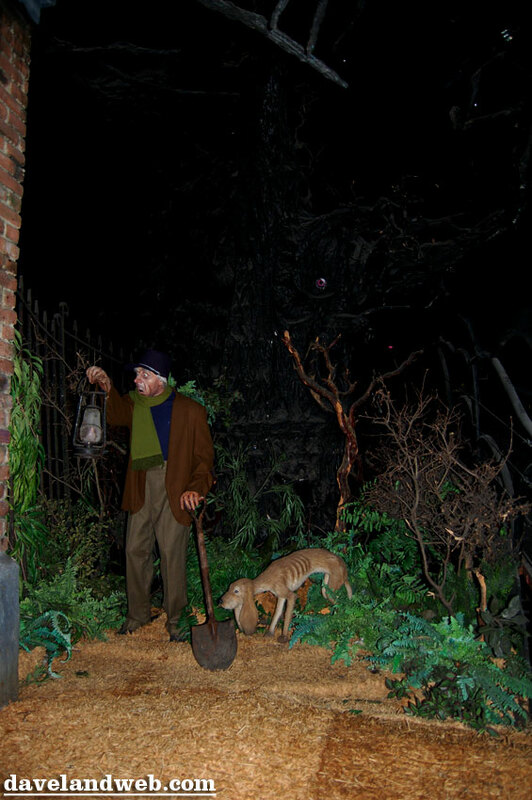 The set, the lantern, the shovel, the darkness, and the woeful dog…Disney’s vignette has all the elements of “The Body-Snatcher”’s final scene. Robert Louis Stevenson, “The Body-Snatcher,” in The Complete Short Stories of Robert Louis Stevenson, ed. Charles Neider (Cambridge: Da Capo Press, Inc., 1998), 438. ← GET YOUR GHOST-ON FOR HALLOWEEN SATURDAY, OCTOBER 8! Don't miss the queue! Enter your email address to subscribe to this blog and receive notifications of new posts by email. Haunted Disney Tales, Skeletons in the Swimmin' Hole and its author have no connection to the Walt Disney Companies or any of its affiliates; similarly, this fan site is not operated or endorsed by the Walt Disney Companies or any of its affiliates. Love Disney Parks? Plan a trip at www.disneyworld.com!